I’ve had this on my mind for awhile now, but have held off on posting anything out of fear I’d be declared the Grumpiest Person on Earth. But, as each day’s commute has given additional reasons to seethe, I realized I can’t, in good conscience, not post anything. 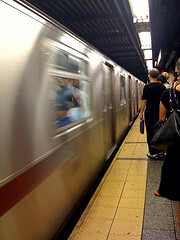 So…I give you: The Top Ten Subway Riders I Hate Most. Or, in other words, The Top Ten Subway Behaviors Most Likely To Make Me Hate You. I understand one of life’s earliest – and perhaps hardest – lessons is learning to share. And, as an only child for the first ten years of my life, I perhaps lack adequate training. But: It is a truth (more or less) universally acknowledged that people can be gross and terrible. And, therefore, sharing a car with roughly 8 million gross and terrible people is no picnic. 10. Close Standers. I understand that sometimes trains get crowded. And, generally speaking, if a train is too packed, I’ll wait for the next one. (I heard a conductor admonish the passengers he was ferrying one summer day, “You’re human beings! Not cattle!”) But…if there’s enough room for you to stand at a reasonable distance from me, I expect you to do so. And I don’t think that’s irrational. I find it all sorts of unnerving when you do not respect this. In short: STEP OFF, BUSTER. 9. Seat Hoggers. So you went on a shopping spree and have 12 new outfits with matching shoes for each? I DON’T CARE. Figure out a way to transport your loot without taking up extra seats. Sure, I could come up and ask you to take your damn stuff off the damn seat, but I know you know that it shouldn’t be there. Empty trains are one thing – pretend you’re queen for a day for all I care — but if it’s crowded, you’re rude and terrible if you just leave it there. The end. 8. Closing Door Jumpers and Door Holders. I think this will be the most controversial as I expect readers to say, “What’s wrong with trying to make a train? Or helping someone out?” And this is one of the few times I’ll agree with the MTA: Jumping in while doors are closing and holding doors delays everyone else on the train. You may not be in a rush to get where you’re going, but someone else undoubtedly *is*…and nothing is worse than when YOU are in a rush and you have to watch commuter after commuter rush in the doors that keep trying to close so we can finally be on our damn way. I think New York would be a much more pleasant place overall if we could agree to respect closing doors. Sure, it stinks when you’re stuck on the platform…but you can take solace knowing that you won’t be inconvenienced the next time you’re not running late and actually made the train. 7. Crowded Train Freaker-Outers. I know the feeling – “OhmygoshhowamIgoingtogetoffthistrain? ?” But – trust me: in seven years of riding the rails — even when I was trapped in the center of the car and had my neck strategically craned so that I was looking at the only spot on the train that wasn’t blocked out by human flesh, I’VE NEVER SEEN ANYBODY MISS THEIR STOP BECAUSE IT WAS TOO CROWDED. Not once. Sure, you have to be a little assertive and let everybody know that you want to get off, but I promise the riders of New York City’s Subways aren’t conspiring to trap you on the train. In fact, it makes our ride all that much more pleasant if you are NOT there. So, dear rider, when you panic after the train leaves the station prior to your stop and want to move toward the door, please know that you are disrupting the delicate balance that all other riders have created in terms of what precious space exists for each of us. What’s more, with closed doors, we have finite space to move in…and it just makes it even grosser and more terrible until we’ve struck a new balance with you by the damn door. So. PLEASE wait until the train has stopped. We’ll let you off – I promise. 6. Backpack-Wearers. Including this sort of makes me a bit of a black-kettle-caller, but, at the same time, I always make a conscious effort to move my giant purse and/or laptop bag in front of my stomach or, when that isn’t possible, I take my bag(s) off my shoulder and hold it/them low in front of me. NOTHING IS WORSE in a crowded train than an idiot with a giant backpack. (I include purses, shopping bags, man-purses and laptop bags under the “giant backpack”-umbrella.) It’s like there’s a whole other person standing behind (or next to) him/her – that’s how much space it takes up. I’ve been in situations before in which a backpack-wearer continually bumps into me and, childish though it may sound, I hold my ground, refusing to move for said stupid bag. It’s annoying to get hit repeatedly, to be sure, but it also makes hating the bag’s owner totally justifiable. All you have to do is remove it and set it down at your feet. You don’t even have to put it on the gross floor – you can rest it on your shoes. And, in so doing, you’ll open up room for the rest of us. And we won’t hate you. It’s a win-win. 5. Pole-Leaners. Simply put, they are about as inconsiderate as it gets. Sharing is caring, folks – even my eight-year-old niece knows that and she’s been saying it for years. So when you lean up against a pole and make it impossible for anyone else to hold on, you’re being a jerk. And, even if you’re wearing headphones, I don’t believe that you’re blissfully unaware of what you’re doing, swept away to iPodland — and THAT makes you an even BIGGER jerk. Once, I was coming home from work with a men’s softball team and an idiot in a sweater and an iPod and a book. And said idiot was leaning against the pole, listening to music and reading. Nice for him. BUT…I had to gingerly hold the pole up by his neck (although perhaps I should have jabbed him in the neck with my fat finger? You think that’s what Emily Post would have done?) and the train suddenly started up and one of the softball players reached out for the pole, but realized he’d have to hold it down by the jerk’s nether region and he pondered it for a moment and then decided to hold on to the ceiling. I saw this play out and we both sort of laughed and, in theory, I suppose it was a nice, friendly moment with an anonymous New Yorker, but I would be willing to sacrifice said moment in exchange for a pole to hold onto. 4. Doorway Standers Who Lean. Nothing is worse than if you actually manage to snag a seat and some yahoo stands sideways in the doorway and leans back into YOUR seat space. I’m sure it’s a comfy pose, but then you, as the person seated, have to lean back or sideways in order to avoid said leaner’s back and/or you have to clear your throat or be a big fat meanie and say, “Excuse me!” when the whole thing could be avoided if the Leaner would just stand where s/he is supposed to. 3. Elbowers. Similarly, it is also annoying when someone seated decides to thwart Leaners by resting their elbows on the partition. (Some A trains have glass so you can’t do this. They are beautiful trains.) Then you, as the Stander, have to hold yourself at sometimes precarious positions to avoid said elbow. Can we declare a truce? I won’t lean on you if you won’t elbow me out of the doorway? 2. Platform Standing-in-Fronters and Rush-Aheaders. Literally nothing irks me more than when I am patiently waiting for a train at the station and someone comes along and stands in front of me. Do they really not understand that I was giving the Third Rail a little space? Or is it THAT IMPORTANT that they get on the train before I do? I’ve said it before – if I’m not in a hurry, I won’t get on a too-crowded train. So the odds are that I’ll happily let you by me if it’s not a train I need to board immediately. But one of the quickest ways to get scowls from me for countless stops is to stand in front of me when I was already waiting. I HATE IT. I also hate people who push ahead when you’ve been patiently waiting. They, too, are jerks. I hope Dante saved a ring for them. 1. Not-Waiters. Or, more specifically, Subway Riders Who Are In Such a Damn Hurry to Board the Train That They Cannot Possibly Wait For You To Get Off First. In general, rules are meant to protect us. I can get behind that, more or less. And so – here’s the only other time I’ll agree with the MTA – when that anonymous male voice asks people waiting in the station to please let passengers off the train first, I think everyone should listen. It’s simple physics really: Only so many people can fit a given space. And in order for new people to come on to the train, old people have to get off. And yet the #1 Worst Subway Offenders, IMHO, are those who throw this rule to the wind and stampede onto the train as soon as it pulls into the station. Just the other day, I was at Jay Street and two women who looked like linebackers (T is teaching me about football) were standing in front of the doors. And, childish though it may sound, I refused to move until one of them finally stepped aside a little. Again, New York, please: Can we just strike a deal in which I promise I will always quickly get off the train if you will stand in an orderly fashion outside the doors and GIVE me room to deboard? It’s not rocket science. And, until you Not-Waiters get it through your thick heads, I will continue to give you dirty looks. Ball’s in your court. Granted, I was totally a fairweather fan this season (as in, err, every other football season of my life)…but I *do* love a good underdog story (with the single exception of the Braves in the late 90s) and so I was thrilled when I caught the end of the game last night (much like Plaxico Burress caught that touchdown pass on the first-and-10 with 39 seconds remaining). Earlier in the day, I saw Joe (who happens to be my landlady’s daughter’s cousin…and also the plumber who fixed my bathroom) carting a six-foot sandwich down our tiny street. “Hey! That’s some sandwich,” I said. I wonder if this bodes well for UCLA in the NCAA tourney next month…? And stupid Joakim Noah and his giant hair and his tennis champion of a father are finally gone.